Artist Jody Pinto (b. 1942) currently lives and works in New York City, however, she has been teaching at the Pennsylvania Academy of Fine Arts in Philadelphia since 1978. She began her public art career in Philadelphia with projects in empty lots and abandoned buildings. 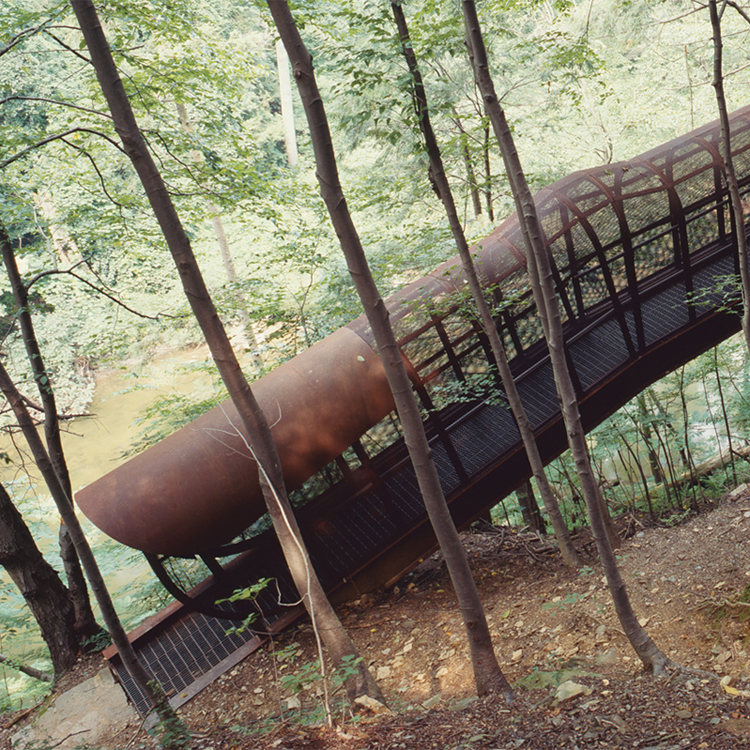 In 1987, the Association for Public Art commissioned Fingerspan, a weathering steel pedestrian bridge located on a natural trail along the Wissahickon Creek. Fingerspan is featured on the Museum Without Walls™: AUDIO program. She is working with the Delaware River Waterfront Corporation on Land Buoy, a beacon and observation tower for Pier 53, a new waterfront park along the Delaware River at Washington Avenue in Philadelphia. Other current projects include a master plan and design for a two-mile canal path and bridge to Scottsdale, AZ; a proposal for a 2,000′ cable-stayed pedestrian bridge in Phoenix, AZ; and a project for the University of Connecticut. Pinto has been involved in over forty collaborative projects around the world, from master planning to integrating art into architecture and landscape. She has received numerous awards including the national AIA Honor Award for “Art in Public Spaces,” and two national ASLA Design Honor Awards. Her artwork is represented in the permanent collections of many museums in the U.S. and abroad. Pinto was the recipient of the Fleisher Founder’s Award in 1992. Pinto wanted to link the human body with the natural environment in such a way that viewers themselves, passing through the work, would help to establish the connection.